A band from Genova, Gleemen were formed around 1965 by Pier Nicolò "Bambi" Fossati, guitarist extraordinaire and Hendrix lover, and also included long time members Cassinelli and Traverso along with guitarist Marco Zoccheddu (later with Nuova Idea). Their only album, issued in 1970, is a good rock album, with strong 60's influences and some typical elements of later Garybaldi work: the wild, Hendrix-inspired guitar playing of Bambi, the organ background and a solid rhythm section. Some bluesy tracks are present, like the longest track on the LP Chi sei tu uomo, and the album has a very good average level, though by no means a progressive work. The same line-up changed name to Garybaldi in 1971, the only difference being a slighly more progressive oriented sound, keeping the same style as previous band, and the wild Hendrix-inspired guitar playing of Bambi Fossati above all. They had a very interesting debut with the single Martha Helmuth in 1971, the back cover of it stating "from now on we're not Gleemen, we're Garybaldi" to declare their change of style. Nuda, a year later, is a much more mature album than Gleemen, with the long beautiful suite Moretto da Brescia taking the whole of side two and the four tracks on side one also on a very good level. A very important album, housed in one of the best covers of the era, designed by cartoonist Guido Crepax. The band had an intense live playing, supporting the likes of Uriah Heep, Van der Graaf and even Santana in their italian tours, and theirs was a constant presence at the most important italian pop festivals in the early 70's. Second album, Astrolabio, released on Fonit label, is a lesser work than Nuda, with just two side-long tracks, Sette? (recorded live) and Madre di cose perdute, both tracks also issued on a single in shortened form. The tracks contain long improvised parts that confirms the high level of Fossati's playing but seem less inspired and can't be compared with the first album. Keyboard player Lio Marchi is also present on the album though not a member of the band, that kept playing as a trio until the end of 1973. 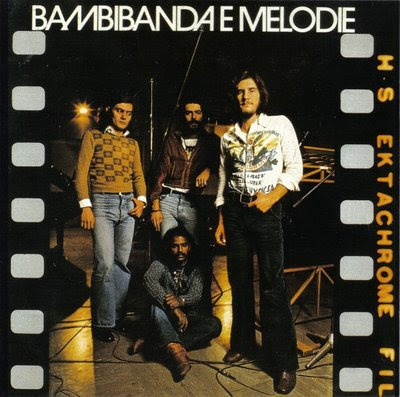 In 1974 a new incarnation of Garybaldi was formed by Bambi Fossati along with old cohort Maurizio Cassinelli, bassist Roberto Ricci and indian percussionist Ramasandiran Somusundaram as Bambibanda & Melodie. Their only album has the usual leading role for Bambi's guitar, but the use of percussion gives a more latin-inspired feel that sometimes reminds Santana. Percussionist Ramasandiran Somusundaram, previously active as session musician, also released an album and no less than three singles (in a more commercial vein) between 1974 and 1976 on the Magma label. Bambi Fossati kept playing under the name of Bambibanda for some years before reforming the old group in late 80's with a new line up including Marco Mazza (guitar) and Carlo Milan (bass) along with Maurizio Cassinelli, and they released an album, more song-oriented, in 1990, as Bambi Fossati & Garybaldi. A new album has been released in 2000, called La ragione e il torto. 05) Mare Delle Terre Medie. Line Up : Ivano "Bambi" Fossati (Guitar , Vocals) , Roberto Ricci (Bass) , Maurizio Cassinelli (Drums) , Ramasandiran Somusundaram (Percussion). Tracklist : 01) Pian Della Tortilla. 02) Libera E Felice. 03) Calabuig! 04) Piccolo Gitano. 05) Mare Delle Terre Medie. 06) Canto Del Sole.